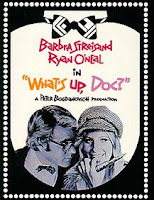 Random Oasis: What's Up, Doc? This movie is so classic. It's early 70s, so it's very unpretentious, but it's just outright funny. It's all about 4 identical travel bags and how everything goes haywire when people start trying to steal one or another, and there's more than one involved. And they're all on the same hall of the same floor of the same hotel. There are so many shenanigans, and little things that make fun of other things going on at the time (the last line of the movie is the best ever). Barbara Streisand is incredible in this. She sings, but it's not a musical. Ryan O'Neal is really funny as a slightly absent-minded musical researcher competing for a grant. It's a screwball comedy. 'Nuff said.